Inersiens prefer knowledge and experience. Anything that one learns or experiences is shared among friends who share among their friends and so on. Information benefits the whole. It's not uncommon for young Inersiens to "marry old" so that the younger one gains experience and knowledge by proxy. Married (or united) couples share memories when they unite. 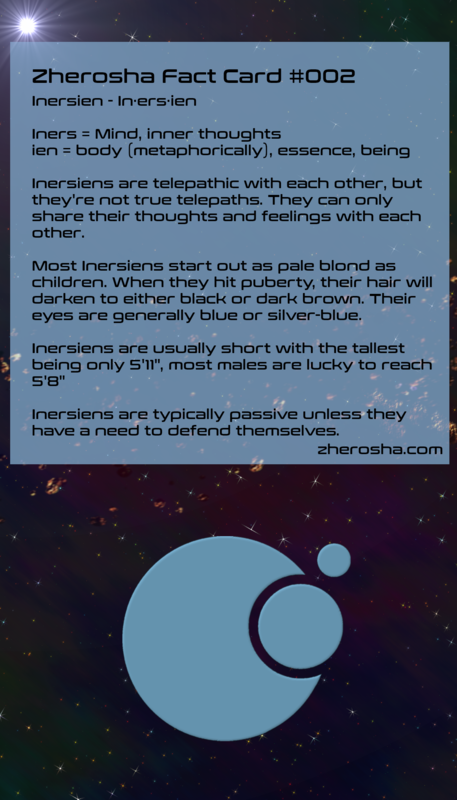 Inersiens unite by sharing a piece of their energy. Typically, Inersiens are heterosexual monogamous, but on occasion, they will "release" each other by returning a piece of their energy. That said, because of the age differences in most couples, it's not uncommon for one to have more than one spouse. When the older Inersien dies, the "younger one" (now older) will marry another younger Inersien who is looking for a more experienced partner. The city is the only place where there are Inersiens. The Inersien population suffered two population implosions and now are on the rebound. To make sure that their numbers continue to increase, the city had made provisions so that all Inersiens, both citizens and non-citizens are safe. Bonus facts: Natisiens need Inersiens to help boost their immune system. If there is a virus, usually a group of Inersiens will stay for a few days with the tribes. They would bed-share (platonically sleep in the same bed) with those who are ill. Inersiens are naturally immune to most illnesses, but Natisiens are not. The energy from Inersiens help Natisien's immune system, so whatever illness is affecting them is fought off.